Typically relegated to just special teams and for good reason, as he continually grades as one of the best in the NFL as a special teamer, Giants safety Michael Thomas earned a number of defensive snaps and made the most of them against Tampa Bay. He was lockdown coverage. He intercepted a pass in the red zone at the end of the first half and allowed -4 yards in coverage when targeted. The Giants linebackers continue to be a problem spot for the New York defense, as Alec Ogletree struggled in run defense in his gap assignments, and BJ Goodson and Tae Davis made mistakes in all three phases, especially in coverage. Goodson and Davis were tasked with matching up with OJ Howard at times, and the former first-rounder proved too much for them. Saquon Barkley has already shown that he’s a playmaker and can produce the chunk plays, but this may have been his most consistent and disciplined game as a runner in the NFL. Barkley got early gains inside on the Bucs’ run defense and stuck with that attack throughout the game. We know Barkley can create big plays on the edge of the defense, but his consistent inside running exploiting the work of his offensive line and tight ends was a change of pace and one that can take him to the top level as a running back in the NFL if produced repeatedly. Only four targets for Odell Beckham Jr., but he made the most of each and every one of them. No one tracked with Beckham and when opportunity allowed, and the Giants went away from the ground game that worked so well, Beckham came up with big plays down the field and showed his strength at the catch point on an eight-yard score that established a three-score lead early in the fourth quarter. 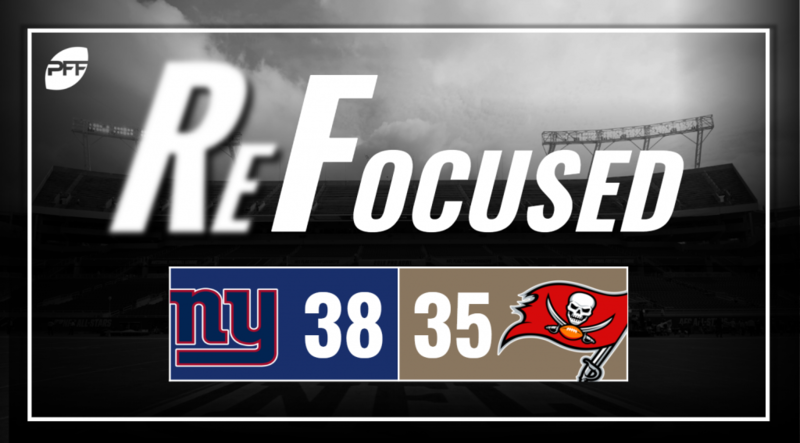 The tale of two quarterbacks continues this season, as the Giants brought the reign of terror on the Fitzmagic show and then allowed Jameis Winston to mount a furious comeback only to fall short after a failed onside kick. Starting quarterback Ryan Fitzpatrick took his shots and continued to test tight coverage, resulting in three interceptions. Winston took over and did more to take what was given to him though he benefited from a couple of dropped interceptions, as well. Wide receiver Mike Evans made the most of his eight targets, as he turned that into 141 yards, a touchdown, five first downs and a perfect passer rating on the day. The Bucs’ run defense was exposed by Barkley. Though they got contact on Barkley consistently around the line of scrimmage, it was often arms or players lunging back to their gaps, which resulted in consistently good gains after and through contact for Barkley. Only Carl Nassib stood out in a good way for the Tampa Bay’s defensive front, as their defensive line continued to struggle against the run. Short their best two linebackers, Tampa Bay also made no impact plays from the second level. Jason Pierre-Paul picked up a couple of sacks in his return to New York on power moves, taking advantage of knocking blockers into piles both times to get free. Pierre-Paul was among the Bucs who struggled against the run, but his glimpses of big plays as a pass-rusher gave a hint of what might have been had the Tampa run defense been able to come up with any kind of answer to Barkley and the Giants’ ground game. The Giants were driven by their ground attack, and their control of the line of scrimmage ensured that their passing game could be lent on solely for added value, never pushing them into situations where Tampa Bay could attack Eli Manning & Co. The poor play of Fitzpatrick put Tampa Bay in too big of a hole that Winston wasn’t able to overcome. Perhaps head coach Dirk Koetter needs to rotate his qarterbacks weekly to feed the hot hand.